Nowadays, DNA testing has played an important role to learn more about us as well as our pets. By learning about your pet’s lineage, you can get an invaluable wealth of information about his health from your vet. That’s the truth! Furthermore, you can also offer insight into your pet’s behavior. That’s why you need a canine DNA test kit. In this post, we will give you the importance of dog DNA tests. 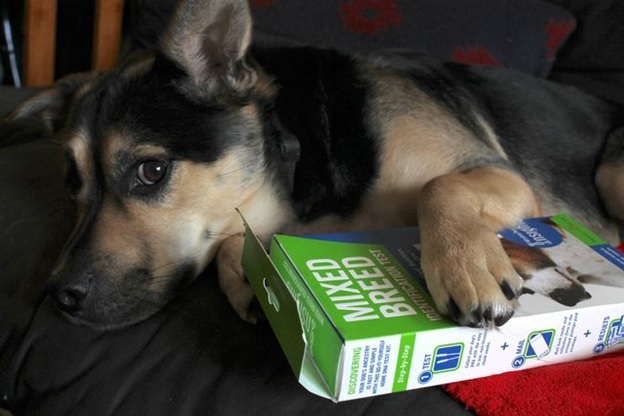 Also, we will list the best dog DNA tests for mixed breed today. What’s a Dog DNA Test? How is Dog DNA Testing Done? Many people wonder what the purpose of a dog DNA test is. In general, there are a lot of purposes when mentioning the best dog DNA tests. They help to determine the dog’s breed. Furthermore, they have the purpose of analyzing the dog’s health. Indeed, some of them can be able to offer more than 100 health results. Remember that these packages are not similar. It’s hard to answer the question “what breed is your pet?” Only with a DNA test, you can get the exact answer. This method will help to satisfy the most curious of dog owners. Once you know exactly your dog’s breed you can understand his personality traits. As a result, it’s easy to concentrate on your dog’s unique habits when training as well as socializing your pet. In fact, every breed has their own hereditary personality traits. So, each breed needs different training methods. DNA test allows you to train your dog properly. As a pet owner, it’s important to care for your dog carefully. You need to determine the genetic health risks related to your dog’s breed. It allows you to be aware of the genetic health risks your dog can get. You can get a registered ID number as well as a certificate of your dog’s DNA genetic makeup thanks to a DNA test. This is considered as a great way to show your love to your dog. The fact is that we had to pay the hundreds of dollars only a few years ago. But, the price is not a problem today. Today’s DNA tests have become more affordable than ever. You can get a DNA test for your dog even under $60. If you want an exact DNA test, it’s better to collect cheek cell samples. You know, DNA databases used for matching DNA are based on using cheek swabs. Actually, the way to collect DNA samples doesn’t only include blood samples. Because of advances in technology, we can get a DNA test for your dog at an affordable price. Normally, you had to take about 6 weeks or more for historically results in the past. However, you can easily result in less than two weeks. It’s easy to collect a sample from your pet without painless. You just need to use the special polyester type swab and rub it inside your pet’s cheek. It takes about 20-30 seconds. It’s essential to do this twice once you don’t get enough DNA on each swab. In brief, you need about 2 minutes for the entire process. It’s fun and exciting to get a DNA test on your dog. You can also do the test by yourself. So, try a DNA test on your dog to be sure of your dog’s breed. Today, there is a wide range of DNA tests for dogs on the market. Some of them are considered to be better than others. Thus, it’s important to spend your time reading dog DNA tests reviews. Then, you can make your investment wisely. You need to note some of the differences such as the number of detectable breeds, the health test performance, the number of genetic markers, and the traits the test can be able to detect. Keep them in mind. And, you should know a cheap dog DNA test may not be a good decision. It’s best to determine the most accurate dog DNA test you can buy. Wisdom Panel, a division of Mars Incorporated, has reached over 800,000 tests so far. They’re recognized by the AKC. It comes with 2 animal DNA tests: Wisdom Panel 4.0 and Wisdom Panel Health. Wisdom Panel 4.0: The cost of this test is 84.99$. It takes about 2-3 weeks for a test. You can consider applying this test for purebred, designer, and mixed breeds. Through this test, you can know purebred ancestry identification, info on physical traits, weight profile prediction, the possibility of Exercise-Induced Collapse, as well as MDR1 genetic mutations. In addition, you will get a predicted weight profile, a unique discount code, and a genetic trait analysis. Your vet also needs to know the result. Wisdom Panel Health: The test ensures to give you info about potential genetic health conditions. The price of this test is $149.99. It takes about 3-4 weeks. Through this test, you surely receive a full genetic disease report, a personal dog profile, reports on morphology and other traits. It’s easy to buy it through online retailers. And, this is also the only buying method for this test. The Embark is known for 160 health results and more than 200,000 genetic markers. That’s why it’s in our list today. This test offers a ton of info about your canine pal. The database of the test comes with over 150 breeds, even including coyote, wolf, as well as village dog ancestry. It can be able to give a very comprehensive picture of your dog’s health. It allows you to prepare for possible issues thanks to lots of info about your dogs the test provides. It takes about 6 to 8 weeks for the result. This test cost $189.00. This test has tested for 95 major dog breeds until now. After receipt of the sample, it takes about 2 months for the result. You can also easily check the status of the result by an online link. It provides you with a custom certificate about your dog’s DNA composition. Also, it includes a percentage breakdown of breeds in your dog. Plus, you can also know a personalized analysis of your dog’s breed such as genetic health concerns and personality traits. It costs $68.98 USD. This is a good choice for those who want to compare your pet to genetically known purebreds. This test allows you to determine whether your furry friend is a specific breed. It helps you to compare your pet to genetically known purebreds. The price of this test is $77.65. This test is for you if you are looking for ones similar to the Wisdom Panel DNA test. You just need to take a DNA sample from a swab on the inside of your dog’s cheek. It will offer the accurate result because the DNA here is the same in your dog’s blood. You can also do it at home by using a cheek swab without a help from your vet. First, you need to order a kit. Then, put a swab that you take from your pet’s cheek in a test tube. Next, move it to the lab. And, you will get the result from the lab in your mail after a few weeks. You needn’t a blood sample. More importantly, remember to read the instructions carefully when you take your dog’s DNA sample. Especially, remove all of your hair or eyelashes that fall on the swab for the most exact result. There are many categories of dog DNA testing results. They include primary, secondary, and mixed. Primary: if the result shows that your dog is 50% or more of the breeds recognized. Secondary: if the result shows that your dog is less than 50% of the breeds recognized. But, it still can to make a significant impact. Mixed: if your dog is identified in breeds recognized while they may offer little impact on his looks and health. You can get some important clues about your dog’s health as well as his behavior if you know your dog’s specific breed. Some breeds can be able to develop health issues. So, with a DNA test, your vet can help you know specific health problems of your dog. In addition, you can also adjust your dog’s diet and exercise to suit his nutritional and exercise needs. Your dog’s genetics can decide partly their temperament. You can easily determine behaviors related to your dog through know his breed. It’s best to consider buying the Wisdom Panel DNA Test Kit if you own a mixed breed. Also, you can choose it when you don’t know exactly your dog’s breed. It’s not a problem. This test allows you to compare your furry pet to over 250 breeds. Of course, you will get a trove of good information regarding your pet as well. The Embark Dog DNA Test is a great choice for owners who are looking for the most comprehensive dog DNA test kit. It’s popular for more detailed results than others. But, you have to pay much money for this test. If the price is not a problem for you, we recommend you to buy the Canine DNA test. It ensures to provide the basics. On the contrary, you can choose the Wisdom Panel or Embark. So, depending on your need, consider choosing one above. The key factor is the health information as well as the most accurate reports. As the result of the dog DNA test results, we have six popular mixed dog breeds. This dog breed is known for their abilities as a guard, guide, and rescue dogs. They are famous for their intelligence, temperament, strength, and herding ability. The German Shepherd mixes can come with different appearances depending on each breed crossed with them. Normally, these dogs have the black and tan coats. These mixed dogs have upright ears, dark saddle over back, and dark face mask. These dogs include the Bulldog, the American Staffordshire Terrier, Staffordshire Bull Terrier, American Pitbull Terrier, and Bull Terrier. The Bully type breeds come with a more square head, especially their head can be broader-chested. The American Staffordshire Terrier is known for being intelligent, stoic, loyal, and hard working. These dogs are one of the top family dogs because of usually friendly natures. Moreover, they are very energetic due to regular exercise. This mixed dogs come with more similar standard Labrador Retriever traits such as brown, yellow or black coat color, drop ears, as well as short hair. This dog is popular in the mixed breed population. These dogs are mixed in with the American Staffordshire Terrier. They come with a permanent eyeliner look, according to Dr. Erin Chu. In addition, they have a usually spotted tongue. They also have decent personalities. Chihuahua mixes are small dogs. They just weight from 4-10 pounds. Especially, these mixed dogs come with a variety of coat colors as well as face shapes. According to Tenenbaum, these dogs have a lot of personalities. Because they are small, they are great choices for living in smaller spaces, including apartments. Chihuahua mixes also have potential physical traits such as a shorter muzzle, upright ears, and rounded head. Chihuahua mixes can also have shorter-than-normal legs. Generally, these mix dogs are smaller than purebred Chihuahuas when it comes to the overall body size. These dogs are playful. They are known for their boundless energy. As for physical traits, it’s easy to notice a bit shorter muzzle, the muscular body, the dark facial mask, and a brindle coat color. These dogs can easily develop a type of cancer. You know, a dog DNA test can give pet owners important clues about their dog’s behavior and health, but this is not all parts of the equation.